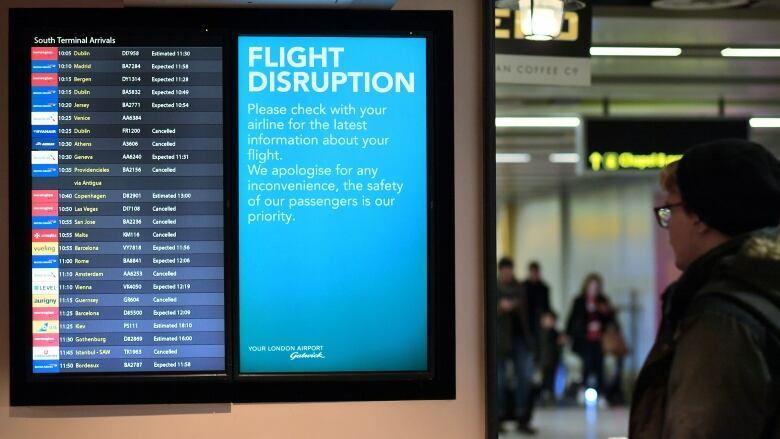 Police in the United Kingdom say they have made two arrests in connection with a drone disruption at London's Gatwick Airport. Police have arrested a man and a woman after rogue drone operators crippled London's Gatwick Airport for three days by repeatedly flying onto the airfield, sparking a major security response. In a statement, Sussex Police said the arrests were made late on Friday. No group has claimed responsibility for the disruption, which affected at least 120,000 people on Wednesday and Thursday. "Our investigations are still on-going, and our activities at the airport continue to build resilience to detect and mitigate further incursions from drones," the statement read. For two days, drone sightings near the airport have wrought travel chaos for hundreds of thousands of holiday travellers, with British authorities so far unable to track down the rogue drone operators. "While we investigated [Friday night's drone sighting], airfield movements were suspended," a Gatwick spokesperson said. "This was a precautionary measure as safety remains our main priority. The military measures we have in place at the airport have provided us with reassurance necessary that it is safe to reopen our airfield." 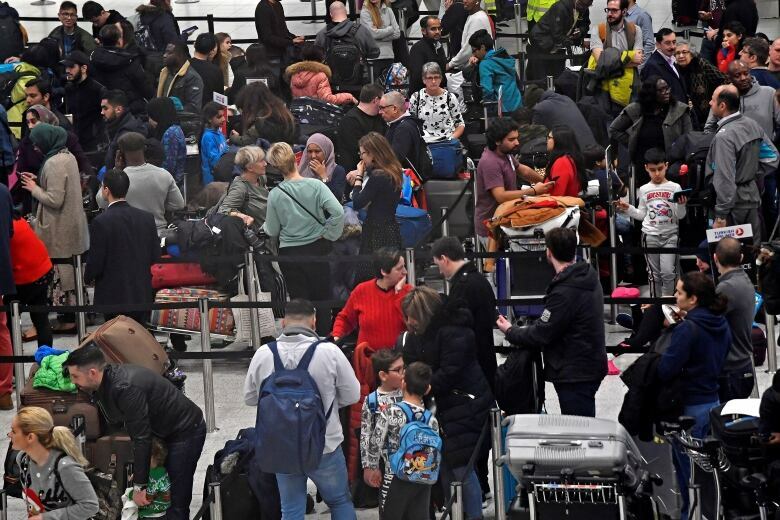 Drone sightings at Gatwick — Britain's second busiest airport — have caused the airport's most significant disruptions since a volcanic ash cloud cancelled flights around the world in 2010. The airport said some 700 planes were due to take off on Friday, although it warned there would still be delays and cancellations. Britain called in the military and police snipers on Thursday to hunt down the drone and its operator, who flew what is thought to be an industrial-style drone near the airport every time it tried to reopen. Fearing the prospect of a deadly collision between a drone and an airliner, authorities first closed the airport's runway on Wednesday night after officials spotted two drones near the airfield. The drone sightings have caused misery for tens of thousands of travellers stranded at Gatwick. Many slept on the floor as they searched for alternative routes to holiday gatherings. Watch: Expert weighs in on the challenges and regulatory hurdles in the world of drones. Transport Minister Chris Grayling said there had been about 40 sightings of "a small number of drones" while the airport was shut down. He told the BBC the drone disruption at Gatwick was "unprecedented anywhere in the world." Grayling lifted night-flying restrictions at other airports to ease congestion caused by diverted aircraft. Police Detective Chief Supt. Jason Tingley said "our assessment, based upon the information that we have available to us, is that this incident is not terrorism related." The British military has joined police and aviation authorities in the search for the culprit or culprits behind the drone intrusion, which police said was designed to cause maximum disruption over the holiday period. Richard Parker, head of the air traffic management technology firm Altitude Angel, said this was the first time a major airport had been hit by such a sustained and deliberate incursion into its airspace. "It's sophisticated — not from a technology side, but it's organized. People have charged lots of batteries and are deliberately trying to avoid being caught, probably by driving around to different locations," Parker said. Watch: See the chaos at Gatwick during the delays. 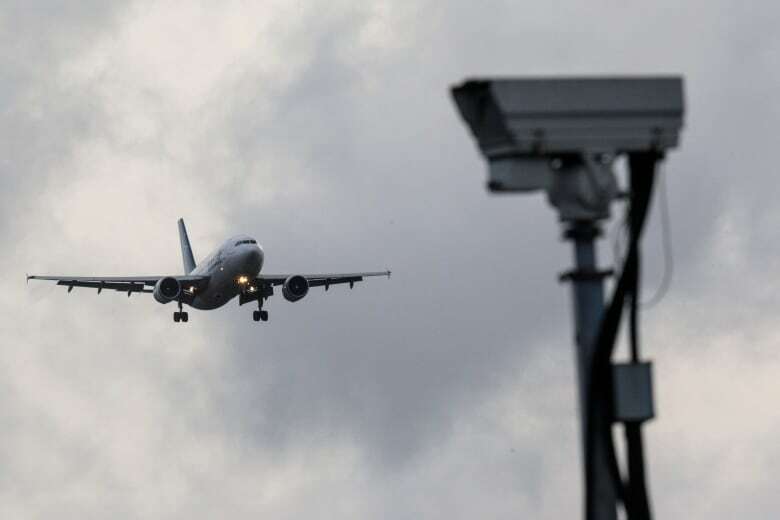 The British Airline Pilots' Association said it understood "detection and tracking equipment" has been installed around Gatwick's perimeter since the drone intrusion. The Defence Ministry refused to comment on what technology was deployed, but drone experts said airports needed to deploy specialized radar reinforced by thermal imaging technology to detect such unmanned flying vehicles. 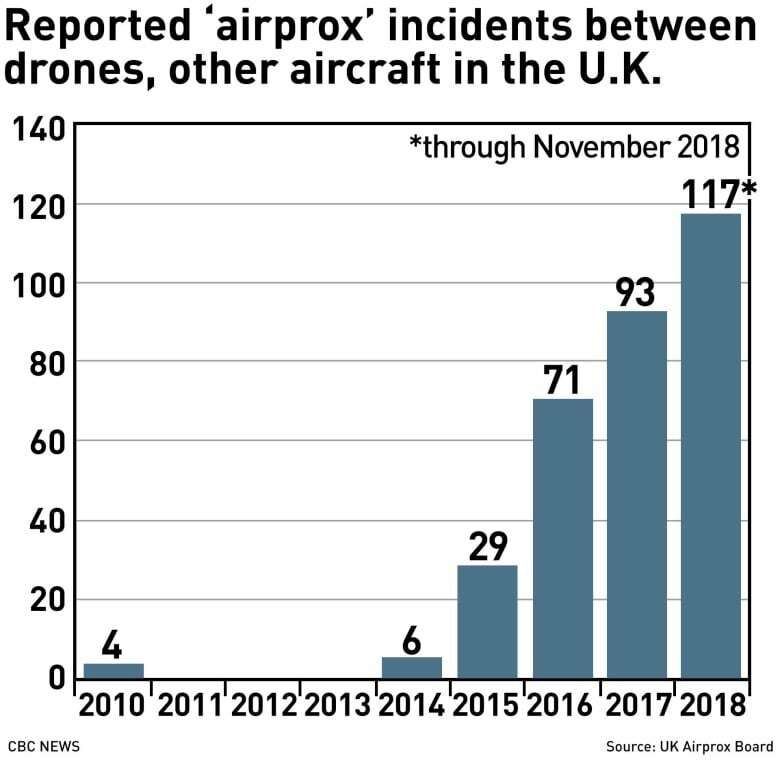 Reported "airprox" incidents involving private drones and other aircraft in Britain have more than quadrupled in the last four years, with 117 incidents already recorded in 2018, according to the U.K. Airprox Board regulator. Airprox reports are filed in the U.K. when pilots or air traffic controllers feel the distance between two aircraft could compromise safety. It is illegal to fly drones within one kilometre of a British airport boundary. Flying a drone near an airport carries a maximum penalty of five years in prison. Gatwick, which competes with Europe's busiest airport Heathrow, west of London, had said Sunday would be its busiest day of the festive period. The airport, about 45 kilometres south of central London, sees more than 43 million passengers a year. About 110,000 had been scheduled to pass through on Thursday.